Retrograss is Mike Seeger, John Hartford, and David Grsman. The band’s only album, the 1999 Retrograss (Acoustic Disc), is an inconsistent, fascinating mess: the old-timey treatment doesn’t flatter Otis Redding’s “(Sittin’ on) The Dock of the Bay” quite the way it does the Beatles’ goofy “When I’m Sixty-Four.” Hartford’s mannered vocals are the disc’s most serious flaw, especially on Chuck Berry’s “Memphis” and the Redding tune–he often sounds like he’d rather be somewhere else. And on “Hound Dawg,” a sparse arrangement of the Big Mama Thornton song Elvis made famous, Hartford and Grisman’s stilted enunciation comes off as almost parodic. Bob Dylan’s “Maggie’s Farm,” on the other hand, works fine as a Dock Boggs tune, and Berry’s “Maybellene” sounds appropriately hot-blooded propelled by the boing-boing of Seeger’s mouth harp and Hartford’s bluesy banjo–probably because Berry adapted it from a country song in the first place. Unsurprisingly, Retrograss does just as well, if not better, when it covers folk and bluegrass tunes: Randall Hylton’s “Room at the Top of the Stairs” prickles with existential dread, Hartford’s fiddle bawling convulsively over Seeger’s obsessive single-chord banjo patterns, and standards like Earl Scruggs’s “Flint Hill Special” and Jimmy Martin’s “My Walking Shoes” practically catch fire. The timeless, home-grown music of the late mulch-instrumentalist and folklorist Mike Seeger nostalgically evokes a bygone age of old-time rural music, early acoustic blues and pre-World War II country strains – all “performed with the affection and dedication of a true scholar,” as a reviewer for the American Record Guide put it back in 1964 on the occasion of the original Vanguard release. This album was recorded as the influential group he had recently co-founded, the seminal old-time revival trio New Lost City Ramblers, was adjusting to the sudden departure of fellow co-founder Tom Paley (first to Sweden then to England, where he remains active at 84). Seeger effortlessly breathes new life into songs from a wide swath of styles, all emblematic of the Southern folk tradition and including the riotously satirical “We Live A Long Long Time To Get Old,” a relatively recent composition by Knoxville, Tennessee, hillbilly musician Jimmy Murphy. Nice-to-hear-agains also include a trio sourced to the Carter Family (Seeger’s clear-voiced recall of A.P.’s inviting “Hello Stranger” and his bluesy version of “It’ll Aggravate Your Soul” and Maybelle’s English folk song-oriented “Fair And Tender Ladies”) as well as the a cappella “Young McAfee On The Gallows” (a cautionary “goodnight” ballad by Jean Ritchie), a droning dulcimer-rhythmed “Waterbound,” the banjo-driven instrumental “Leather Breeches” and an optimistically melodic redo of Grandpa Jones’ hit “I’ve Been All Around This World.” It’s great to have this classic available once more. Informative liners by both John Crosby and and D.K. Wilgus. BANJO TALES with Mike Seeger accompanies the late National Heritage Fellow, American musician Mike Seeger, on his last musical journeys through southeastern Appalachia, as he records and talks with some of his favorite old old-time musicians. In early 2009, though weakened from a ten-year battle with lymphoid leukemia, Mike traveled through the southeast (Alabama, Kentucky, North Carolina, Tennessee, Virginia and West Virginia) by car to record some of the finest southern traditional banjo players in their homes. Filmmaker Yasha Aginsky accompanied Mike and his wife Alexia and filmed as Mike interviewed, recorded and interacted with the talented and colorful musicians who were being recorded. Many of the banjo players also sang or fiddled in these sessions as well, and they were occasionally joined by other musicians, including friends, brothers, fathers and Mike Seeger himself. In every encounter and conversation Mike inquired about the role of old-time music in the player’s past and present life, revealing an on-going rich cultural heritage that forms the heart of this documentary. After the last shoot in June, Seeger and Aginsky made plans to get together in early September in California to begin editing the material they had collected. Upon his return home to Lexington, Virginia, Mike fell very ill with an aggressive new cancer, multiple myeloma, and on August 7, 2009, he died peacefully at his home, leaving this wealth of video material in Yasha’s hands. In the months just before his short, losing battle with cancer, Mike and Peggy managed to reprise the sound, and indeed many of the same songs, that sweetened the Seeger home more than a half-century ago. Their newly-released collection, Fly Down Little Bird (Appleseed Recordings, 2011), is a fourteen-cut journey into a distant but resonant chapter in the continuing revival and popularization of rural American, mostly Appalachian, music. They did indeed, and over the years they left them very much as they’d found them—or rather, as they’d adapted them originally. For although there’s a plantation porch, corn-shucking quality to these recordings, it’s a whimsical illusion. These charming renditions of old ballads, tunes and nonsense rhymes don’t evoke the Lomax field recordings nearly as much as they do Ruth Crawford Seeger’s 1950s living room. The evocation is unapologetic and endearing. There is the broad Seeger instrumental range, including fiddle, guitar, several different banjos, piano, Hawaiian guitar, harmonica, mandolin and lap dulcimer. Duets are sung as often in octave unison as in country harmony. There is silliness (“Fod!” and “Jennie Jenkins”), fond familiarity (“My Home’s Across the Blue Ridge Mountains’) and homespun politics (“The Farmer is the Man”). But mostly there is comfort. This collection is delightful from the first listen and grows on one steadily. It’s a simple, cunning capture of two old sibling souls, up in years at long last, singing and smiling back at a slice of yesterday. with Bill Malone, author of Music from the True Vine: Mike Seeger’s Life and Musical Journey (University of North Carolina Press, 2011) Copyright (c) 2011 by the University of North Carolina Press. All rights reserved. Q: In your book’s introduction, you point to the irony of being Mike Seeger’s biographer because you were once sure that you didn’t like him. What changed? A: In the early 1960s, when I first saw and heard Mike, I had the impression that he was aloof or, at worst, arrogant. After I got to know him, I found that he was instead shy and reserved. I also mistakenly thought that he was an “interloper,” that is, an outsider who didn’t grow up with the music as I did, and therefore didn’t really understand it. I can now admit that my impressions came from ignorance and biased feelings about the culture from which he came. I have learned over the years that Mike had actually been listening to, and loving, old time music ever since childhood. 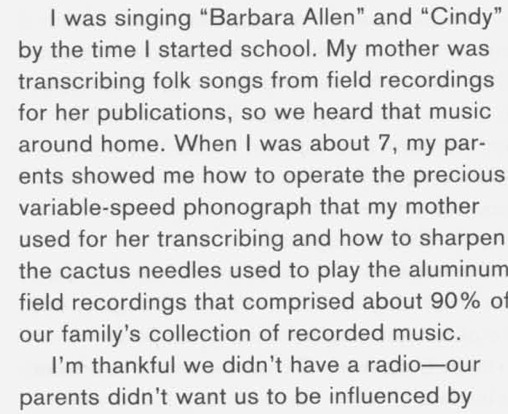 While my introduction to country music came through the radio, Mikes came from the Library of Congress field recordings and the commercial hillbilly recordings that his family owned. My knowledge of this fact changed my perception of his authenticity and made me face up to my original prejudices. Q: What does your books title refer to? A: Music From the True Vine refers to the body of music made and shared by black and white rural Southerners. Mike believed that it was the vine, or source, for most of America’s music. He spent his entire life trying to preserve and make people aware of this great body of music. 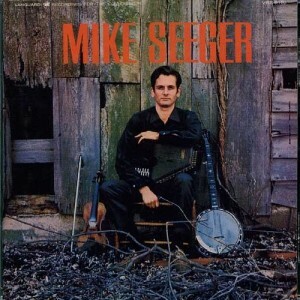 Q: What stylistic elements of Mike Seeger’s music set him apart from his contemporaries?